Current affairs preparation for IAS Exam should be given priority during IAS preparation because most of the questions asked in every stage of UPSC IAS Exam are related to the current events. 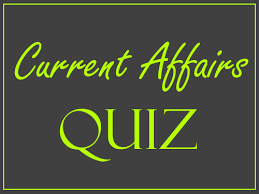 Hence, here we have provided Current Affair quiz based on the recent happenings in the month of May 2017 for IAS Prelims 2017. Current affairs should be prepared with a great enthusiasm and spirit during IAS Exam preparation. A sincere study of current affairs would be beneficial for both the stages i.e., IAS Prelims and Mains Exam. So, the IAS aspirants should keep practising the current affairs quiz on basis during IAS Preparation. Here, we have provided current affairs quizzes based on the important events happened during the week from the month of May 2017. 2. Recently, which of the following countries has officially offered support for various ongoing as well as upcoming development and infrastructure projects in the North-Eastern region?